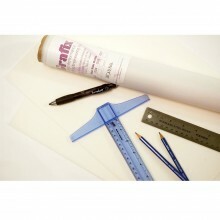 Grafix Drafting Film is a polyester film with a one or two side matte translucent drawing surface. This film accepts lead, charcoal, graphite, coloured pencil, pen and ink with ease. It erases cleanly without smearing or leaving shadows.Product Features: High translucency Will not tear or yellow Lays flat Archival Dimensionally stable Widely used in engineering, drafting, laser cutting fabrication, stencil making, drawing and mixed media applications.Grafix Drafting Film is offered in .003”, .004”, .005” and .007” thicknesses.